DOUST STANLEY JAMES 14.10.1930 -17.3.2019 Passed away peacefully in Bethavon Residential Care, Northam WA. Youngest son of James Alfred Doust (dec) and Alice May Doust nee Mears (dec). 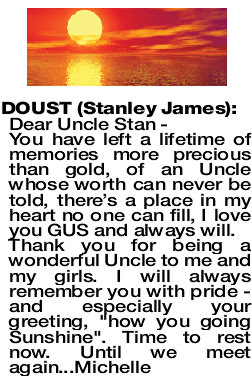 Dearest brother of Carol Jackson nee Doust (dec) and brother-in-law of Laurie Jackson (dec). Beloved Uncle of Michelle, Great Uncle of Rebecca and Chloe, and Great Great Uncle of Henley. Treasured memories of you are ours to keep forever. Rest in peace GUS. Our sincere thanks to the Bethavon staff who cared for Uncle Stan during his final five years. A Funeral Service for the late Mr Stanley James (Stan) Doust of Northam will be held at the St Johns Anglican Church, Wellington St, Northam on FRIDAY Morning (22.3.2019) at 10.00am. Following the Service a Burial will take place at the NORTHAM Cemetery. Family have requested bright colours to be worn. Much loved uncle, it's been a while but it's time to get back on your bike and enjoy the road ahead. Don't forget to pick up a few cans on the way. You'll be sadly missed. Love you always, Donna and Mick. Fond memories of a great- uncle. Loved the humour, you will be missed. You have left a lifetime of memories more precious than gold, of an Uncle whose worth can never be told, there's a place in my heart no one can fill, I love you GUS and always will.